When David R. Daugherty, M.D., was growing up in Rochester, he walked to Central Junior High School with his father, Guy Daugherty, M.D., a Mayo Clinic cardiologist. "Since our school was on dad’s way to the clinic, he made a tradition of walking with each of us kids when we reached junior high age," says Dr. Daugherty, when went on to join Mayo Clinic himself, as a psychiatrist. "We checked our progress by the bells in the Plummer Building. Hearing the chimes helped us get to school on time." That youthful memory led to an idea: Could the carillon have a set of chimes that are unique to Mayo Clinic? The Plummer Building carillon was installed in 1928 as a gift from Mayo founders William J. Mayo, M.D., and Charles H. Mayo, M.D. To mark the time of day, Dr. Will chose the melody "Westminster Quarters," which is played on the quarter-hour and is best known for its association with the Big Ben clock tower in the Palace of Westminster in London. Thinking of an alternative to the "Westminster Quarters," Dr. Daugherty approached John Noseworthy, M.D., Mayo Clinic's president and CEO, who reached out to the organization's Heritage Days Committee. A bit of research and fortuitous timing led to a solution that strikes the right note. As Dr. Daugherty explains, "While we don’t know what prompted Dr. Will to choose the 'Westminster Quarters,' it may have been, at least in part, to add to the prestige of the blossoming medical enterprise he and Dr. Charlie were building on the remote Minnesota prairie by bringing music from the heart of London that was so well recognized and esteemed. Times are different now, almost a century later, and the prestige of their institution has been well-established through its own merits. Perhaps, we have an opportunity now to adopt a new chime — clearly our own — and to encourage its use as a recognized and honored symbol of the mission of Mayo Clinic for our patients, colleagues and community." "Perhaps, we have an opportunity now to adopt a new chime — clearly our own — and to encourage its use as a recognized and honored symbol of the mission of Mayo Clinic." - David R. Daugherty, M.D. 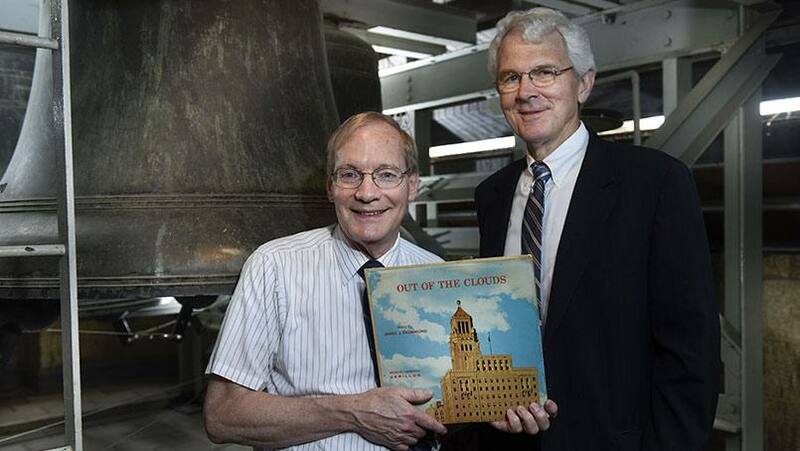 Dr. Daugherty’s suggestion came about the same time that Jeff Daehn, Mayo's carillonneur, received a unique donation — a 1957 phonograph record by Mayo’s first carillonneur, James Drummond. The recording included a set of chimes that Drummond had written for the carillon. What happened next was a harmony of old and new. Daehn adapted Drummond’s piece to fit the bell sequence that tolls the time of day. The resulting composition, "Mayo Clinic Chimes," was tested in May and will premiere officially at a concert on Sunday, June 19, at 2 p.m. on the Annenberg Plaza at Mayo's Rochester campus. Starting in July, Mayo Clinic Chimes will play for the first 10 days of each month, with the "Westminster Quarters" filling the balance of the month. Visit the Mayo Clinic History and Heritage website to hear both musical settings and learn more about Mayo's carillon. For Dr. Daugherty, Mayo Clinic and family are intertwined. He met his spouse, Barbara Chamberlin, M.D., also a Mayo psychiatrist, when they were members of the first class of Mayo Medical School. Their daughter, Molly Daugherty, who works in Mayo's Department of Development, represents the third generation to work at Mayo Clinic. Other relatives have trained here and practice across the U.S.
Central Junior High School was demolished several decades ago. The Mayo Clinic Dan Abraham Healthy Living Center occupies the site today. Dr. Daugherty lives in the same neighborhood where he grew up and still walks his familiar route to the Mayo campus. 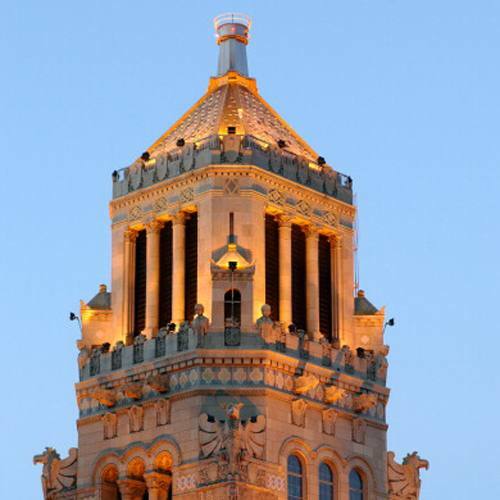 As the "Mayo Clinic Chimes" take their place representing Mayo Clinic, the carillon remains audible in downtown Rochester — even with today’s taller buildings and increased traffic. Now, however, the bell chimes are not calling Dr. Daugherty to school. Instead, they’re reminding him it’s time to visit the gym. There are about 180 carillons in the U.S. and Canada. The majority are located at colleges and universities, as well as houses of worship. Mayo Clinic is the only medical center that has a carillon. With 56 bells covering a range of 4.5 octaves, it is one of the largest instruments of its kind. Learn more about Mayo Clinic's history and heritage. 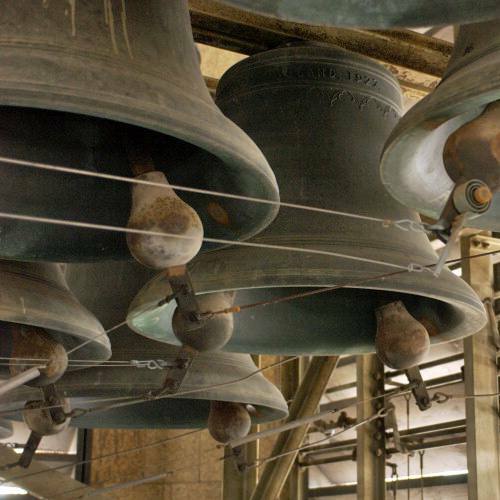 Explore the Mayo Clinic carillon.